Three juvenile Cooper’s Hawks were released Saturday October 25, 2009. Two had been rehabilitated from head injuries and the third from a wing injury. The Cooper’s Hawk, Accipiter cooperii, is a medium sized hawk of the goshawk family. Often misidentified as a Sharp-shinned Hawk, the Cooper’s Hawk is slightly larger (21 to 36 inch wingspan) and has a tail that is rounded in appearance. Juveniles start as cream and brown with a brown crown and yellow eyes. 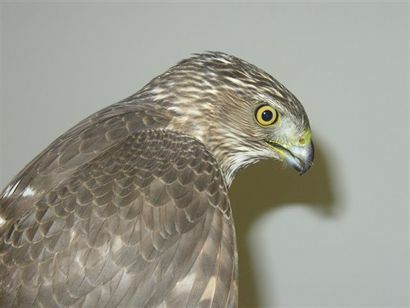 As they mature, Cooper’s Hawk develop the characteristic gray back, reddish brown and cream banded chest, black crown and deep red eyes. While Cooper’s Hawks share a diet that is similar to other raptors, they tend to prey on other birds such as pigeon and dove. Their wings are designed for dramatic aerobatics and can be seen flying with quick short strokes with relatively brief glides. They hunt almost entirely by surprise. Until recently, the rehabilitators of WR&E rarely saw baby or juvenile Cooper’s Hawks. Instead, they only saw adults injured during migration. It has been noted that as the increase in the number of White Wing Dove (a larger dove than the more common Mourning Dove) have coincided with the increase in baby and juvenile Cooper’s Hawks. This suggests that as prey has increased in the Greater Houston area, the Cooper’s Hawks have followed.